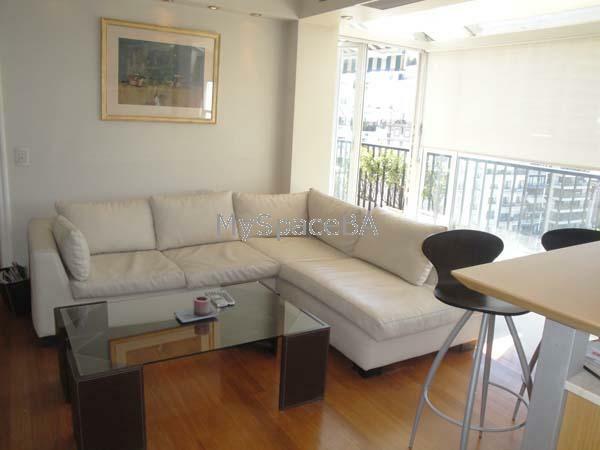 This apartment is located in the heart of Recoleta, it is decorated and furnished to the highest standards. The living room has a large leather sofa with a wide screen plasma home cinema TV 42inch and air conditioning. The kitchen is open plan to the living room and has a breakfast bar. It is fully equipped with all the utensils you could need to make your stay a happy one. There is also a desk , Internet WI FI . The living room has hardwood floors and air conditioning. The bedroom has a double bed with all leather surround, there is a flat screen plasma TV and air con. The bathroom has a jacuzzi bath and shower with the walls tiled in marble. There is also a nice balcony with table and chairs so you can take morning tea or read a book with a panoramic view of Plaza Vicente Lopez Buenos Aires. Very good location, exquisite decoracion, TV plasma 42 inches , home cinema, air conditioning, breakfast bar, desk, Internet Fast Connection WI FI , balcony with furniture and panoramic view. Very good building . Elevators . Cinema, commercial area, restaurants, bars, Santa Fe Av., Callao Av., parking areas, squares, laundry, cybers, etc.